When a homeowner encounters burrowing critters, action must be taken. 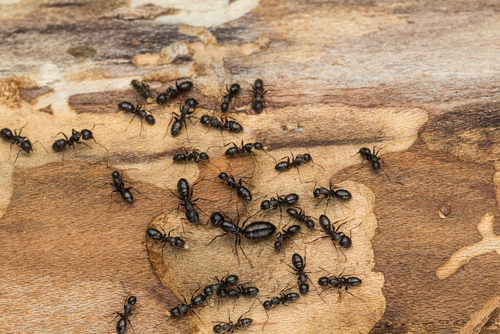 Carpenter ants and termites are both attracted to the wood in your home for different reasons, and they each require different solutions to control. While ants will move on by once they’ve taken what they want, termites may continue to eat through wood until the structure of your home is compromised. Knowing the difference between ant and termite colonies will save time and money and allow homeowners to communicate effectively with a pest control service. These invasive insects cause headaches for homeowners across the nation. While ant colonies and termite infestations are both problematic, each requires a different control method. Identifying key differences between the two allows you to take appropriate action. Carpenter ants are reddish or darker in color, and termites are cream-colored or even translucent. Termites prefer to work under cover of darkness and are rarely seen in light unless the nest is disturbed. Ants move freely in broad daylight. While mature males of ants and termites each have two sets, ant wings vary in size, but termite wings are the same. Termites also shed their wings. Ants have pinched, defined waists, whereas termites have straight, almost nonexistent waists. Termite antennae are straight, but ants will have bent or elbowed antennae. Termites require a diet of cellulose, found in wood but also paper, cardboard, and plants. Ants primarily focus on sweet items. Unlike termites, carpenter ants do not eat wood; they merely burrow in it to build nests. Small piles of wood shavings are signs of ant infestation. Ant tunnels are smooth and finely finished. Termites pack theirs with soil and mud and use crude mud tunnels to connect from wood to the ground. Once you have determined the type of your infestation, you can begin to eliminate the issue. Contact your friendly pest control team for efficient, expert help.